In June 2018, BIO held at Boston attracted more than 18000 attendees from 67 countries. ABLE coordinated the DBT (Department of Biotechnology) supported INDIA Pavilion. Almost 100 attendees from the Public and Private sector from India attended the event. All exhibitors were extremely satisfied with the Convention and the India Pavilion. Eight start-ups were supported by the Government of India to exhibit at the India Pavilion. 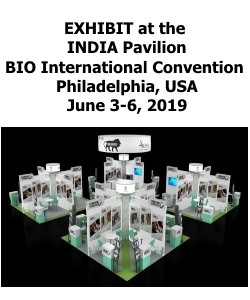 The INDIA Pavilion and program for BIO 2019 is under development. The central government will support 10 start-ups. In case your company qualifies for support it will be communicated when the information is final. The tentative amount is mentioned on basis of ABLE estimates that can change. We invite organizations from the private (SME and larger companies) and public sector to participate as an Exhibitor in the INDIA PAVILION. For details of the INDIA Pavilion and Terms & Conditions please contact us. Apply for stalls by 25th December for Startups. For other organizations last date to apply is 31st December 2018.